This may not sound like a perfect weekend to many. But for me last weekend was perfect. It was a free weekend to do nothing. I could have gone to Florida and bought that Whirlwind.. or gone to Maryland and looked at another boat. I had NOTHING to do. So I did what I wanted to. 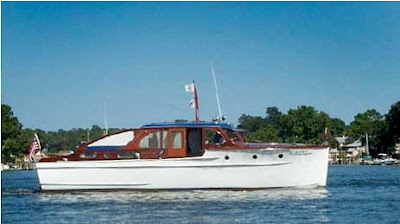 I went and visited my fellow woody boater pal Clif Aimes in Reedville who has one stunning Chris Craft Cruiser. 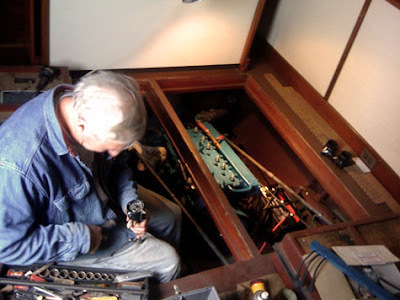 A Email Everyone In The Hobby Of Classic Boating Should Read. A Wonderful Older Riva Video To Remember Carlo Riva By. Work facinates me I can stand and watch it for hours. I don't know if reading Woody Boater every morning qualifies as doing nothing or not. First, you must build a pot of coffee, then hit the shower, get somewhat dressed, walk the dog and then wait around for endless minutes while Woody Boater finally pops up a new post (gives me a chance to sort through the e-mails and check out Boat Buzz). All of this is doing "something" I suppose. The pay-off is that I get to read the daily Woody Boater Story, absorb the content, enjoy the photo(s), contemplate the impact of leaving a meaningful Comment (or not), then, get on with my morning. When arguing with my wife about spending so much time sitting at this keyboard, I tell her that I'm doing "something" but she claims that I'm doing "nothing". So, according to her "I'm doing nothing" and enjoying the stuffing out of it.